Battery Operated Golf Cars are becoming increasingly popular because of their varied uses across industries. Golf Cars no longer are intended solely for golf courses as they have become increasingly useful in industries, resorts, trade shows, government houses, farm houses, airports – to name a few of its many applications. Being battery operated make them even more lucrative in terms of their maintenance and running costs. However, as an average buyer, faced with a host of options – how does one decide which golf car is right for him? This concerns not just the question of meeting requirements but also to ensure good quality and durability. 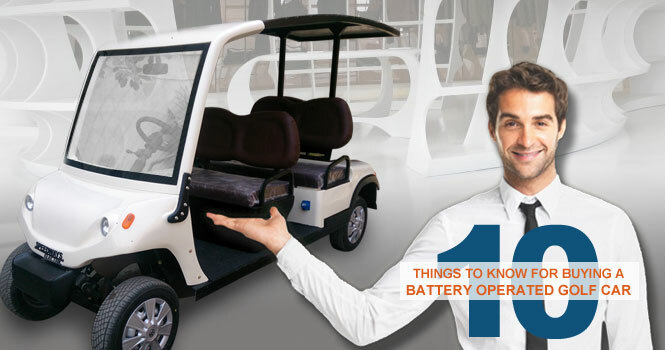 We at Speedways Electric, being the pioneers in the manufacturing of battery operated golf cars in India have put together the following list of essentials you must check for before you make your purchase. We hope this will help you in your filtering process and ensure not only the best application but also the quality in the vehicle you choose. The most crucial element of your decision is to figure how closely the offered product matches your precise needs. Sometimes your needs can be as basic as the number of passengers it can carry or the color of the cart. Sometimes, however, more crucial things are important – like the size of the vehicle or its weight for instance. Here are a list of specifics you should check your options against based on your exact needs. Most battery operated golf carts are offered in a variety of sitting arrangements. The most popular options usually include – 2 seater, 4 seater, 6 seater, 8 seater and 12 seater. Some golf carts have added seats facing back, while some have all seats facing front. The more the number of seats, the more power the golf cart must have to ensure a smooth drive. Also make note that having more seats makes for a longer vehicle which demands a greater turning radius. Only if you have enough area to ensure long turns should you get a battery operated golf car with additional seats. Otherwise it’s easier to move around two smaller cars than one big one. Often color is only a matter of choice but sometimes color can play a greater part integrated into your battery operated golf cart. If your branding requires a certain color, some manufacturers may or may not be able to deliver the exact shade. You may even want the seats to be upholstered in matching colors or the roof canvas to follow suit which is something not all golf carts come with. If you’re looking to brand your golf car with your logo, ensure you discuss your requirements with the dealer beforehand so you can make an informed decision. In areas that are frequented by visitors and has tighter paths – it’s better to get brighter colors to ensure safety and easy spot-ability. An important deciding factor is how closely the battery operated golf car serves the industry you need it for. For hotels, for example, you may want a luxury cart. For internal use, you may require a cart without a roof. For trade shows, you may want a cart that has extra battery capacity to ensure long running times. A lot of variables will rely on the exact usage you have intended for the golf car so have a checklist ready before you get around to studying your options. The durability of your electric cart is of prime importance. For rental models, you need a vehicle that can be fixed easily in case of accidental damage or dents. For areas with bad roads, you need an electric cart that can meet those challenges and still last. For most reasons you should look at purchasing a cart that promises to last a few years and can easily be maintained to achieve that. The built quality should be strong and materials should be of good quality. Make queries of the quality of tires, batteries and other critical components to ensure the product you buy will last a long time without complaint. Like every new product you intend to buy, be sure to pick a trustworthy brand. For any brand to achieve credibility, it takes years of serving good quality and backing it up with timely service. There are always cheaper, more attractive options sitting in the market but it is always a safer bet to go with a brand that speaks for itself. What’s also important is the origin of the battery operated golf cart. Is it being manufactured locally? Are the parts being imported and assembled? Is the vehicle being imported entirely? These parameters affect the overall performance of your vehicle. More specifically, it would be easier to find spares and service if the cart is being manufactured locally. Imported parts are hard to source and usually take time coming in. Such variables can add to the durability of the cart in question significantly. A brand may be an internationally renowned one but what is their local service like? Do they have service centers that can cater to you or on-site service that can come in aid? Sometimes we bank on a product because of the name it carries but when trouble comes calling, the service doesn’t. No matter how good the vehicle is, at some point it demands looking after and maintenance. You should check on the maintenance requirements of the battery operated golf cart you are considering to buy. How long do the batteries last? How often does the water need topping up? Do the tires run out easily? What is the availability of spare parts like? Who can you call in case of a breakdown? Send a list of these questions along with your basic requirements to the dealer to ensure you know what you’re settling on for the long run. Your battery operated golf car should come with an instruction manual. It is a good idea to also ask for a digital version incase the actual manual cannot be found at the time of troubleshooting. Ensure you receive proper operating instructions from the dealer or have someone come in for training of your staff to ensure smooth handling of your electric car. It is also important to receive training for proper driving instructions and ensure your backup drivers are well trained just as your primary drivers are. Although electric carts are extremely easy to drive and operate, sometimes this can also lead to reckless driving and accidents. Proper training will ensure no such incidents occur and also ensure the wellbeing of your vehicle. When comparing models of different brands and dealers, make sure you mark the highlights in the differences in technical specifications. Sometimes higher capacity models are marked with low capacity motors, which can cause trouble if going up slopes and inclines. A cheaper model may compromise on technical specifications and give trouble in the long run. The essentials to look for are the motor, tires, batteries, body fabrication material, braking system, dimensions and turning radius. If you have any specific requirements, discuss with your electric cart dealer and have them suggest the best technical specifications for you. Not all manufacturers provide customizations so if you require custom work, be sure to contact someone who specializes in it. Standard models are sometimes hard to modify so it pays to do your research and find a manufacturer that can offer you a solution. Wheelchair integration, custom accessories, ground clearance, luggage racks, chiller compartments are just some of the custom requirements you may have. There are also ways to integrate advertising tablets or fittings into your vehicle to generate more revenue. Discuss these options and get a clear quote on how much extra they will cost before you commit to a dealer for a specific battery operated golf car. Just like regular cars, battery operated golf cars also have sell back value. Some manufacturers buy their own golf cars back at a good price. Some dealers deal in pre-owned golf cars. At the time of consideration of your vehicle, discuss the sell back value to get a fair estimate. There is also the option to upgrade your vehicle in the future with exchanging your old one in with some extra cost. All these variables will help you in deciding the perfect battery operated golf car for your precise needs. We also suggest getting a complete catalog from your dealer to understand the expertise and variety of the manufacturer and select a few options to pick from. We hope this guide helps you find the perfect electric cart that is not only eco-friendly but is also a joy to own and drive!